As another week has already flown by, I find myself grateful that the Saturday immediately following my previous post was filled with adventure, because if it hadn’t been, this entry might be a little boring. While resting at home when you’re sick tends to make you feel better, it doesn’t make for particularly thrilling writing material. I’m not sure if it was food poisoning or a run-of-the-mill stomach bug that decided to follow me home, but either way it could have been so much worse. I mostly just had to deal with a total loss of appetite, absurdly tight muscles, and no energy whatsoever. Regardless of what it was, drowning it in tea and borscht proved effective in finally chasing it off. Pictured: Tea kettle and pots of borscht and yogurt soup, valiant defenders of queasy stomachs everywhere. 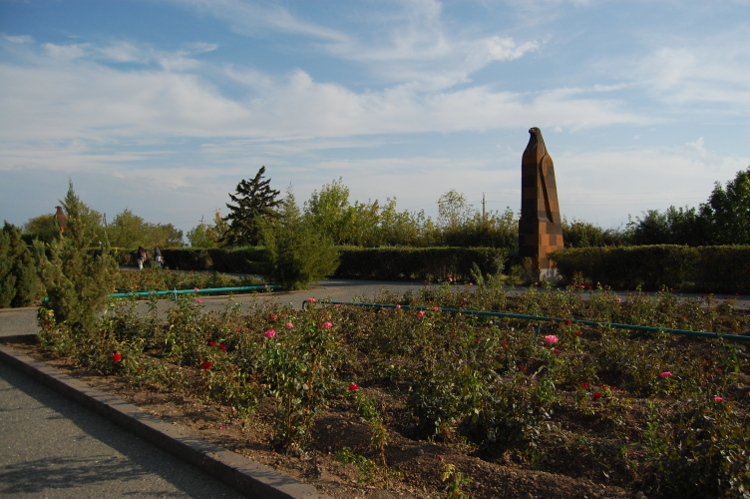 But before all that, we had another lovely excursion, this time going to the Karas Wines vineyard and the Sardarapat Memorial. Karas Wines is a member of a company called Tierras de Armenia that was founded in 2005 by an Argentine Armenian businessman named Eduardo Eurnekian. The company acquired 2300 hectares of land (that’s over 5500 acres, or almost nine square miles) in the Armavir region of Armenia to the west of Yerevan. The gentlest phrase I’ve seen used to describe the area is “previously uncultivated”, though “desolate wilderness” has also been used and might be somewhat more accurate. * I’ll have some pictures down below that will help illustrate. It took us about an hour and a half to cover the sixty kilometers between Yerevan and the vineyard, which meant that I got to spend an hour and a half staring out the window as the Armenian countryside rolled past, as well as a few villages. If nothing else, it gives a glimpse of all the parts of the country that aren’t Yerevan, as well as a lot of stark, ruggedly stunning landscapes. We had a pretty good idea that we were getting close when we started seeing fields of grape vines stretching on all around us in long, orderly rows. As a girl who grew up in northern Idaho where the rolling hills are covered in fields of oat and wheat, the sight was simultaneously familiar and not. To state the obvious, grape vines are a lot bigger than grains and grasses. A view of the vineyards. Once we got there, we found out that we were going to be helping the villagers who are employed by the vineyard as they removed the plastic protectors that had been put in place around the stems of the vines. Sleepy as I was, there was a (sizeable) part of me that felt a sudden dread. It’s one thing to be mildly sleep deprived as you take a tour and listen to people tell about what they do. It’s something else entirely to have to do something yourself. Or, maybe, I was just feeling a little lazy and intimidated by the prospect of having to communicate in Armenian when I hadn’t expected it. As is usually the case, it was actually a whole lot of fun. The plastic protectors were secured in place by thin metal rods which we had to find among the vines. Some of them were hard to find. Some were stuck. Some had tiny vine tendrils all wrapped around them. Each one was just a little different than the others, and it reminded me how much I miss working as a groundskeeper. Lest I give the impression that we spent the day in the fields, each of the little groups we had split ourselves into only did one, or maybe two rows, and each row was probably only about fifty yards** long. Even though harvest was over, there were still a few clusters of grapes here and there, so we also got to eat fresh grapes and sun-dried raisins as we worked. Actually, by the time we got to the end of the row, we all had more grapes than we knew what to do with. Afterwards, we were treated to a lunch of (massive) sandwiches, and we spent the next while just hanging out together and talking. There was even a little bit of dancing as a couple of the more knowledgeable volunteers taught some of the rest of us a Armenian folk dance or two. 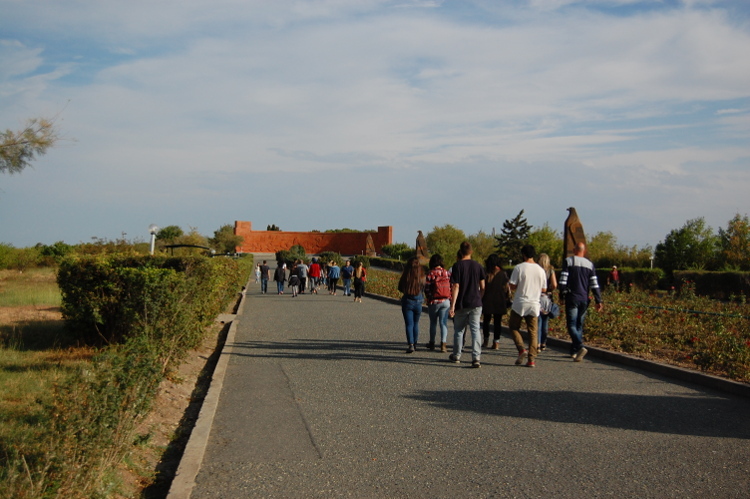 After that, our excursion leaders somehow managed to herd us back onto the buses so that we could take the tour, and we got to learn a bit about the vineyard and what had gone into creating it. I’ll try to hit a few of the highlights. I mentioned above that the land was a mix of “previously uncultivated” and “desolate wilderness”. What that actually means is that the ground was so rocky that no one had thought that it would be worthwhile to clear it for agricultural purposes. This is one of those times when pictures really are worth a thousand words. All those rocks you see right there are just the tiniest fraction of the ones they pulled out to clear the ground, and this is not the only pile like it. Additionally, these pictures don’t show the massive boulders that have been removed from under the surface, or the fact that they are still pulling rocks from the fields every year, or that the 230 hectares that have been cultivated so far only represent about a tenth of the total land that will need to be cleared in this way in order to become useful for growing grapes. The entire endeavor is more than a little incredible. 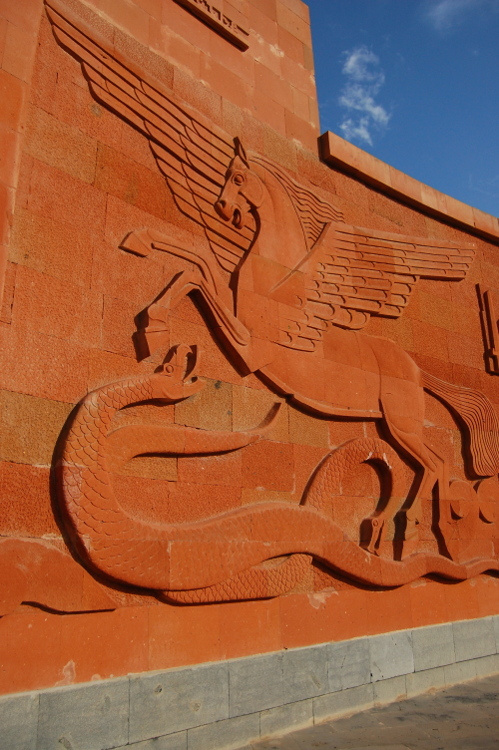 Add to that the fact that Armenians have been making wine for a very long time, and it’s as much a link to the past as a way to look to and provide for the future: Karas employs hundreds of people from the surrounding area, and has chosen to go without certain machinery that would make the process more efficient at the cost of jobs. They are focused on sustainability, using dripline to minimize water waste and organic solutions (pheromones imported from Germany) for pest control as opposed to chemical methods. 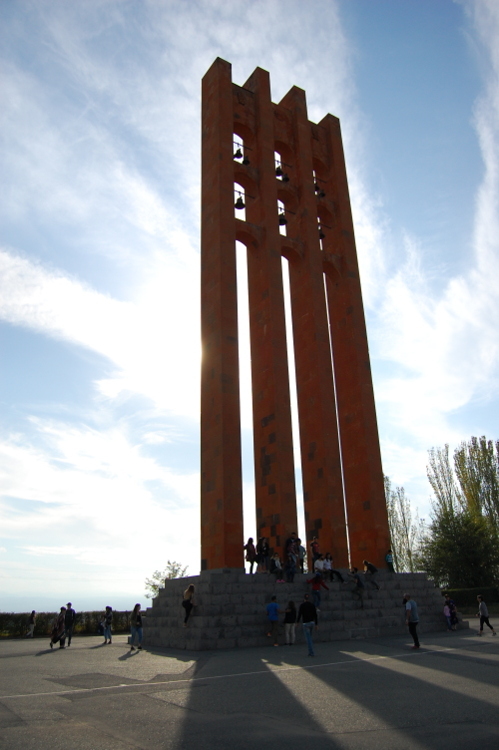 From there we went on to the Sardarapat Memorial that commemorates the battle of the same name fought in 1918 to stop the advance of the Ottoman Empire across the rest of Armenia. They were already in its heartland. 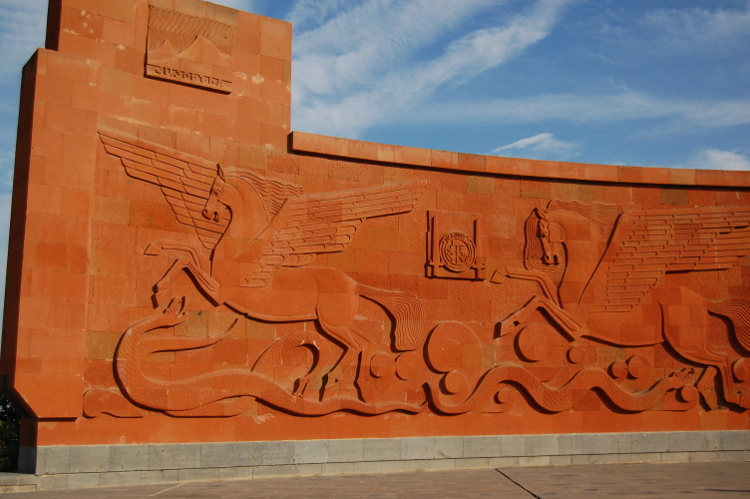 The Armenian army consisted mostly of volunteers, pitted against the trained Ottoman troops. If they had failed, it’s possible that it would have meant the destruction of the Armenian nation. 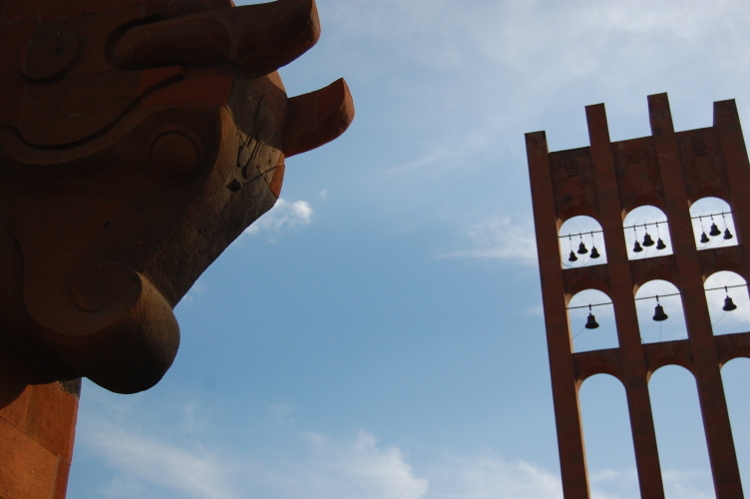 The memorial itself is beautiful: two massive winged bulls made of reddish stone and a 26-meter tall trellis structure built of the same stone and hung with twelve bells that are rung every year on the anniversary of the victory. 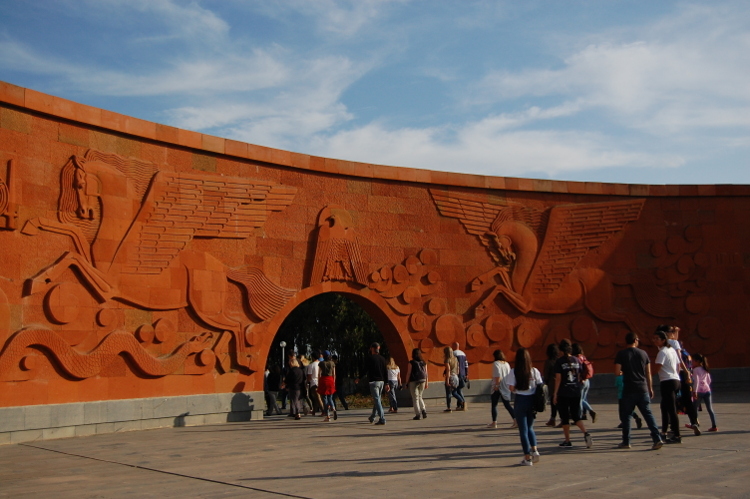 There is also a path edged with stone eagles and a curved victory wall, as well as a beautiful museum containing all kinds of items of Armenian history. I’ve got a few pictures of the monuments, but they hardly do it justice. 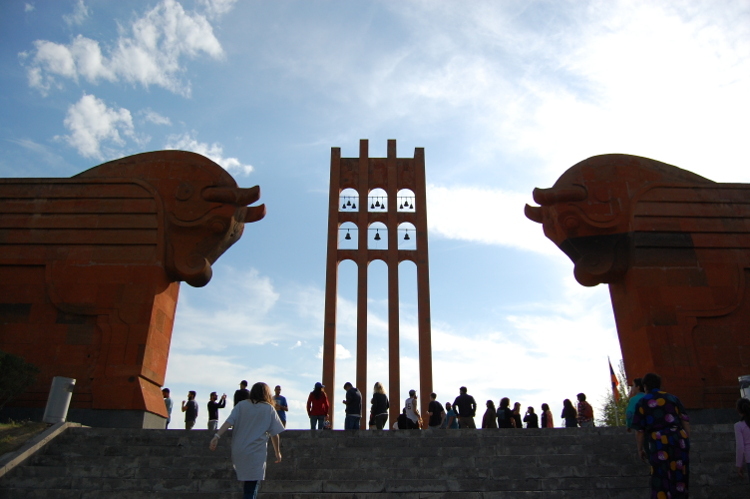 If you ever have the chance to come to Armenia, I would highly recommend visiting it for yourself. That’s all for this week. I feel like I’ve talked forever this time, but as always, there’s so much more that I haven’t said, and I can only hope that I’ve provided a decent summary. As always, thanks for reading, and let me know if you’ve got any specific questions or want more details on anything. I’d be happy to provide! * There’s a folktale I ran across regarding how the Armenians ended up with the particular plot of land that is now known as Armenia. I had a heck of a time finding it when I went looking, and didn’t succeed until I’d already rewritten it, so I’ll leave my retelling down below as well as linking to the post where I found it originally. Back when God was dividing up the earth among the peoples of the earth, the Armenians were late, as happens often enough. But the Armenians pleaded with God, asking for anything, any scrap of land that he had left that he could give to them to live on. Finally, worn down by their endless cries, God relented. So the Armenians took it and built on it and cultivated it and turned it into a place where they could live, and that’s why Armenia is the way it is. As it turns out, the Armenians weren’t the only ones who were late, and once God had given the Armenians their land, the Georgians came up to him and asked if they could have a piece of land to live on as well. But the Georgians begged and pleaded with God as well, until at last he threw up his hands and relented. And that is why Armenia is rocky, mountainous, and hard, and why Georgia has beaches and forests and the Black Sea. ** I should mention here that I am notoriously bad at estimating distances. Please take all attempts with a grain or ten of salt. The idea of being able to eat grapes and raisins while you work somehow struck me as pretty awesome. Also for some reason although I know “sun-dried raisins” are totally a thing, it never occurred to me that they could dry on the vine. Apparently I imagined them picked and then laid out to dry. Learned something new! Wow, the color of the stone on the memorial is incredible. It was fantastic. I’m actually not a huge raisin fan, though I’m pretty sure that’s just because I’ve never had fresh(?) ones before. They were so sweet. It really is. And the same type of stone is used all over the place. There’s also a subtler, pinker stone that’s pretty common as well, and a lot of the monasteries are reddish in color. I was very excited when my brain finally made the connection with Redwall.